Well, at least it's more or less confirmed that this is going to be the last one. "The Hangover Part III" is coming out in a little over two months -- not that you would know that, as there hasn't even been a teaser trailer released for the final installment of one of the most successful comedy series of all time. However, there finally seems to be a spark of life coming from the Warner Bros. marketing team as a poster has made its way online. The poster, released via Twitter, assumes that you at least sort of remember Summer 2011 (which is when the last "Hangover" came out, by the way) -- or rather, specifically, the advertising campaign for the final "Harry Potter" film, "Deathly Hallows - Part 2," in which Warner Bros. bombarded seemingly every other billboard in every single American city with a series of ominous "IT ALL ENDS" artwork featuring bruised and battered "Potter" characters in various battle poses, grimly accessing the closing of a ten-year franchise. 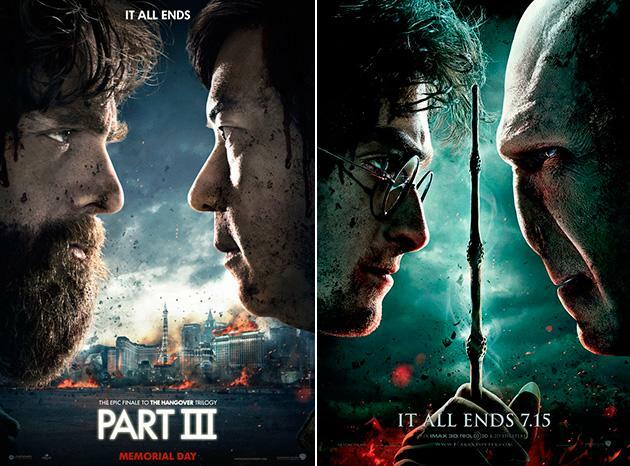 "The Hangover" doesn't quite have the all-encompassing pop culture legacy that "Harry Potter" has, but WB knows that nothing riles up an audience quite like somewhat fatalistic "THIS IS THE END" marketing -- thusly, we have Alan (Zach Galifianakis) facing off against Mr. Chow (Ken Jeong), Harry vs. Voldemort style, as all of Vegas burns in the background, a stunning early vision of what will surely be a dark, epic finale to the comedy trilogy. It's cute. And what's even better is the tweet also announces that we'll be seeing a real live trailer on Thursday. "The Hangover" series chronicles the surreal adventures of the Wolf Pack, a group of guys who are old enough to know better, upon the aftermath of a night of unspeakable yet apparently mostly forgettable debauchery. Armed with only fractured memories, splitting headaches and often very strange and cryptic clues (why is there a tiger in the bathroom and a baby in the closet? ), the men must face the unforgiving dawn, put together the pieces and resolve some crisis, which until the road trip-themed third installment involved getting a groom to his wedding on time. "The Hangover" (2009) grossed over $467 million in worldwide box office, making it the highest-grossing R-rated original comedy ever until it was dethroned by last summer's "Ted," which took in over $543 million. The much-reviled but even more successful "The Hangover Part II" (2011) earned over $581 million worldwide, proving that the entire planet can relate to a bunch of idiots who drank too much. "The Hangover Part III" will hit theaters on May 24, up against the sixth installment of Universal's "Fast & Furious" franchise.